Sometimes, you discover friends who feel like kindred spirits, as if you had known them your whole life – or lifetimes – even if you only broke bread together once. 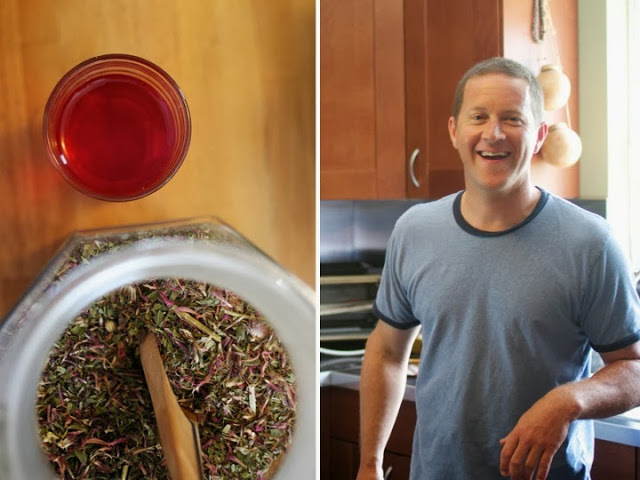 Eaters, meet Grace and Cary Kanoy: kindred spirits, homesteading enthusiasts, digital media wizards, adventure guides and passionate changemakers. This couple is the change we wish to see in the world, and served me one of the most memorable meals this summer. I met Cary in Quito, Ecuador at the office of a small non-profit called EkoRural, where I was working to help build farm-to-city relationships between indigenous farmers and urban families. For two decades, Cary led expeditions around the world through his and Grace’s company GeoCore Expeditions – Ecuador was a country that captured his heart. On this trip, he was taking a dozen board members to visit our non-profit’s various programs throughout the Andes. When I began PEAKS in 2008, we organized mountain trips for philanthropic climbers and hikers who planned to raise money through their ascents in support of impoverished mountain communities. Cary was instantly connected me with local guides, and both he and Grace were supportive of my idea to make a documentary of my own fundraising climb. Grace and Cary are talented photographers and videographers. Through their current venture, GeoCore Films, Cary dons the lens and captures the footage that Grace refines with her original and high quality editing and graphic design – though their roles seem interchangeable. Through Skype, Grace taught me how to wield a camera and develop a storyline. She then edited my amateur shots, and made several short videos that have come to define PEAKS’ brand and tell its story. The marvels of Skype have a way of shaping two people’s rapport – and it was only when I had planned my trip to Groundswell International’s Annual Global Forum in North Carolina that I realized I would have the opportunity to meet Grace in person for the first time. Plus, these two are about the only people whose Facebook posts capture my interest; they’re about as food crazy as I am, if not more. I bowed out of the conference for a day and journeyed two hours by car through the gentle, rugged slopes of the Smokey Mountains to Thomasville, North Carolina. Cary grew up in Thomasville and hadn’t envisioned returning to this small, near-rural town to raise his family. But the Kanoy’s small farmstead has quickly become a beacon of light in a world increasingly passing by the joys of eating from the land while preserving its natural beauty and connecting with family. Their brick house, brightened with sky blue shutters, butts up against Cary’s family farm; their two boys grow up surrounded by grandparents, aunts, uncles and cousins. The Kanoy’s backyard is teaming with fresh fruits and vegetables, clucking hens, rabbits and more. With Cary’s growing skills in hunting and butchering, they produce nearly ninety percent of the meat they consume. They are committed to sharing their own adventures and bringing the missions of local and international food and farming organizations to life with their talented storytelling. Their most recent project is all about how Mushroom Power can save the world. Yes, a bold statement worth learning more about. I arrived at their home and we buzzed with hugs and chatter, making our way slowly from the entrance to the kitchen where Grace asked at last “are you hungry?” I said something shy and foolish, like “only if you are” to which she and Cary burst out in laughter. “Do you really think we wouldn’t feed you?” (They’re equally supportive of my Frisch Kitchen, and we often share tips and kitchen blips). 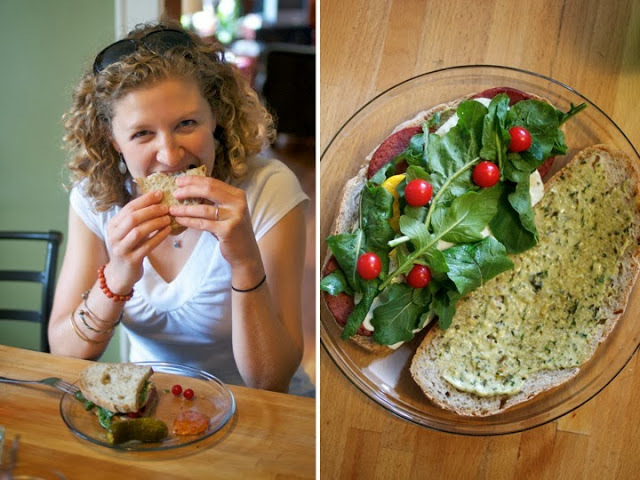 Grace professed that she hadn’t given lunch much thought, so we would have simple sandwiches. 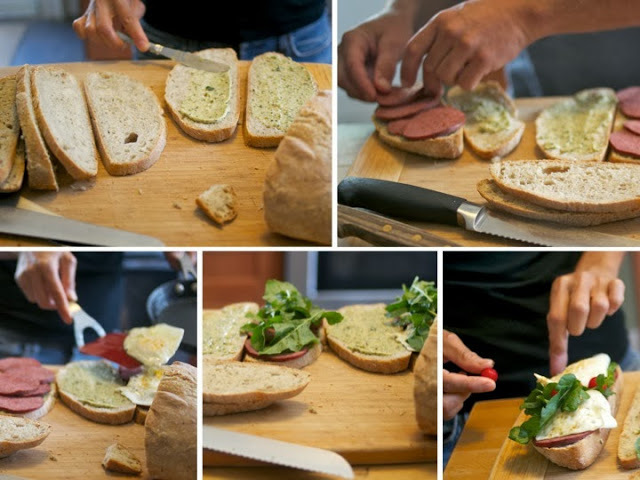 The sandwiches were hardly simple, and were a testament to there committed approach to eating and living. The bread had just emerged from the oven piping hot. 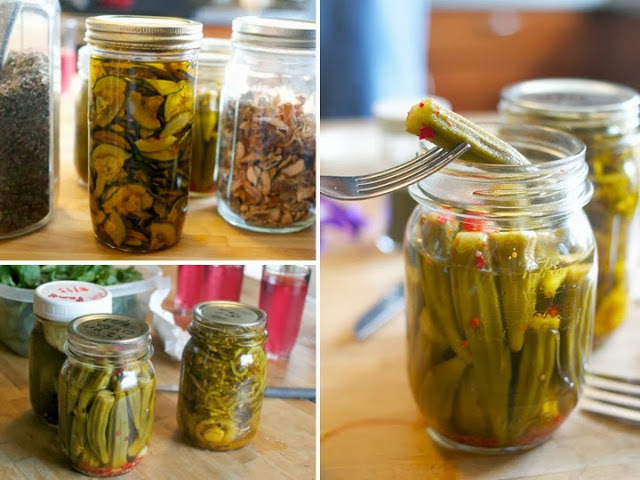 As we waited for it to cool, Cary opened a sampling of pickles – okra, butter pickles, beets. Grace and I scoured a wild edible cookbook, interspersed with camera lessons since I had insisted on capturing the magic of their provisioned cupboards. Cary continued to wave jars under my nose, like powdered cucumber – dehydrated from summer’s surplus – for making authentic tadziki. 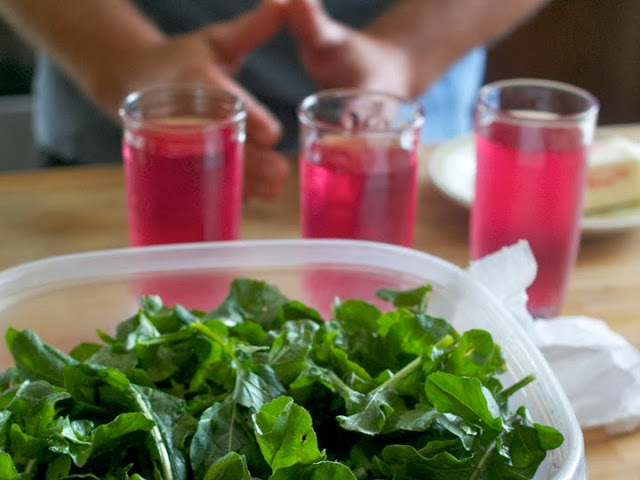 Grace scattered a handful of dried blueberries into my hands, and we clinked glasses of magenta iced tea made from homegrown flowers and herbs. When the bread was sufficiently cool and we had remembered our time was short and our bellies in the mood for eating, Grace and Cary began to dance around the cutting board. I snacked on cherry tomatoes as they took turns piling on the fixings: herbed homemade mayonnaise, homemade venison summer sausage, perky garden arugula, and bright yellow backyard eggs. I plopped some tomatoes on my slice for good measure. In his quest to be resourceful and wade through leftover pickle juice, Cary had invented a pickle dressing in which we dipped our sandwiches lavishly. This is the sort of sandwich I aspire to serve every person who walks through my kitchen door. As we ate our last bites, we began to scoot out the door and return to the high demands of our weekday lives. 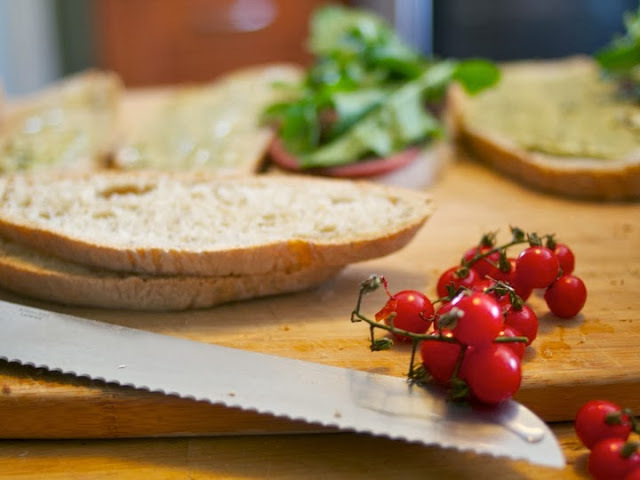 But what joy to pause from the noise and celebrate the stories of our lives and shared dreams over sandwiches, munched in unison around the butcher block in the kitchen. I share Cary and Grace's dilemma in that at least one shelf of the refrigerator begins to resemble a science experiment in mid-winter. I have jars upon jars of pickle juice that I plan to reuse for pickling or use for another project that never seems to manifest before the liquid gets murky. 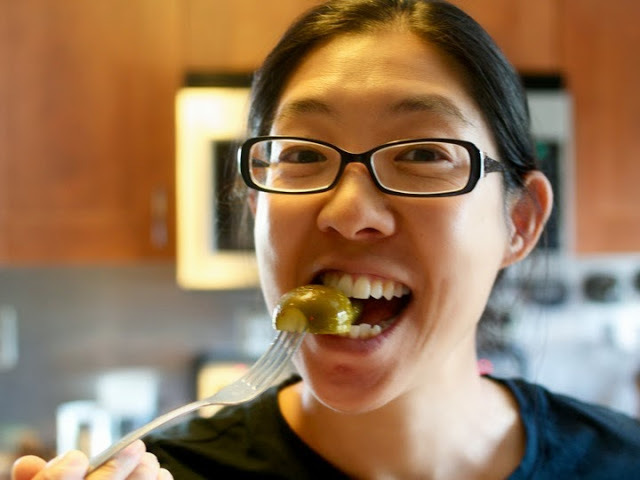 Cary invented this outstanding and unexpected pickle dressing to use up that delicious pickle juice for tossing with salad or serving as a dip. An extra pinch of arrowroot or xanthum gum, or both, will thicken this up even more (but careful - too much will give it a jello consistency). Cornstarch will also act as a thickener, or half an avocado. Each batch will differ based on the brine you made for your pickles (this one originated from pickled ramps). Be creative with the seasoning and herbs - there is no perfect formula, but this is a perfect foundation for making your own version! Put all of the ingredients in a blender, except for the olive oil and salt. 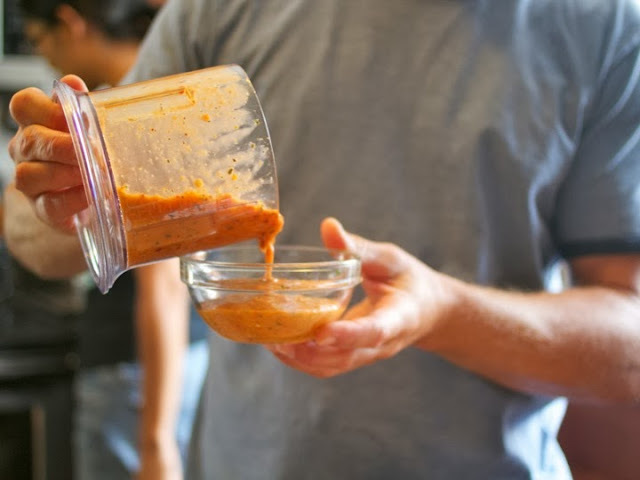 Blend into a puree and while blending, slowly begin adding the olive oil in a steady stream until the dressing becomes creamy and thick. The Xanthan Gum and Arrowroot Powder aren't typical pantry staples, but they do wonders to thicken up sauces and dressings. You can skip them and substitute with a tablespoon of tahini (nuttier) or yogurt (brighter!) and still get a thicker, smooth texture.